I really like to make things the cheap and easy way- with construction paper and tape. This bunting project was no different. It is very easy and fast, and can be totally customizable to fit your occasion. I'd love to see it done in red, white, and blue for the 4th of July, red, pink, and white for Valentine's Day, red and green for Christmas... the possibilities are endless! So you start with construction paper in the colors of your choice. Each piece will make 3 flags, so you can figure up how many you want to make. Fold the paper in thirds, unfold, and cut along those folds. Then, cut triangles out of the bottoms of each flag and set the triangles aside. Remember, this is supposed to be easy... don't measure anything, just eyeball it. Fold over a section about 3/4 inch from the top of each flag. If you're using tape, roll up two small pieces of tape and attach them to the inside of the flap on the very edge (or you could use glue), but don't fold it over yet! Now find something to hang your bunting on. It can be twine, yarn, ribbon, string, whatever. I used white yarn. Place the yarn in the crease of the fold and then fold the flap over the yarn. Keep doing that until your bunting is as long as you want! 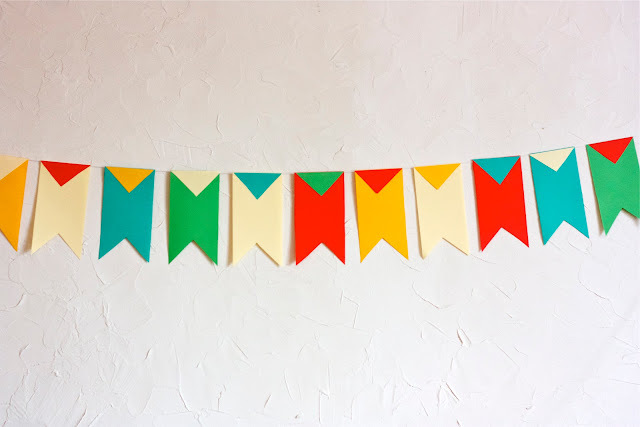 I'd love to know if you use this tutorial to make a bunting. Please leave me a comment and link to your blog or pictures!